In 1980 she won third prize in the massive South Bank Show poetry competition judged by Charles Causley, Seamus Heaney, Ted Hughes and Philip Larkin. She was awarded one of the two £1,000 Scholarships and this, combined with the increasing publicity allowed her to leave the hospital in 1989 to pursue her poetry full-time. In 1994 U.A. 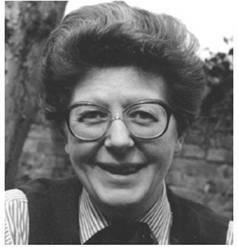 Fanthorpe was the first woman in 315 years to be nominated for the post of Professor of Poetry at Oxford. On the death of Ted Hughes, The Guardian championed her for the Poet Laureateship that was eventually awarded to Andrew Motion. In 2001 she was awarded the CBE for services to literature and awarded the Queen’s Gold Medal for Poetry in 2003, only the fifth woman in 70 years to get it. England and Englishness are central themes in her work where she wittily debunks England’s image of cosy grandeur. A typical expression of this can be found in 'Earthed' and its wry celebration of her homeland with its "gardens loved more than children". She regards a poem "as a conversation between the poet and the reader" and this is evident in her characterful and engaging delivery. Many of the poems are for two or more voices and we can see this particularly clearly in ‘Not My Best Side’.